The mornings are cold, but the days are starting to feel like spring. For now, most of the vegetables available in our inventory are still either storage crops or the last of winter’s greenhouse production. However, our farmers have begun seeding and transplanting in the fields, which means it won’t be more than a few weeks until we start getting in a fresh selection of spring crops. Big news below, so keep reading! Veggies, fruit, and herbs: Apples, beets, carrots, chard, baby greens, kale, leeks, parsnips, potatoes, turnips, frozen sweet corn, frozen squash puree, frozen peppers, frozen pumpkin puree, mushrooms, rosemary. Other: Apple cider, cheese, pudding, yogurt, eggs, cereal + granola, beef, lamb, pork, condiments, maple syrup. Our big project for the season! We hope to launch a new delivery route by July. The route will serve the Winchester-Fitzwilliam-Jaffrey corridor and offer Peterborough and Keene a second weekly delivery day. We need your help to make this route succeed. 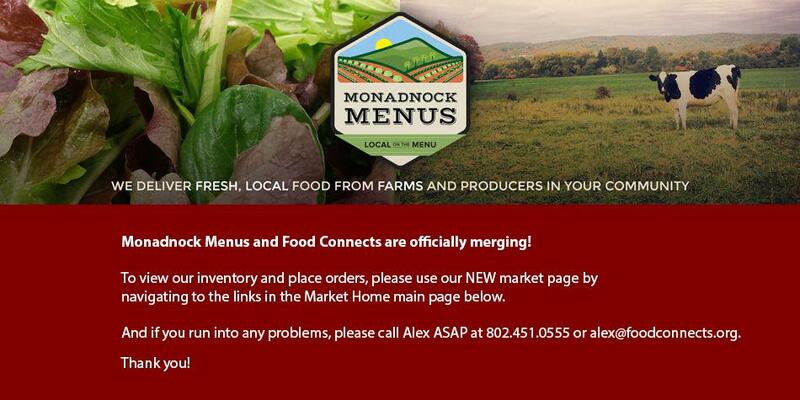 If you know chefs or food producers along the proposed route who want to be a part of the local food movement, please tell them about how Monadnock Menus has helped you, and that we will soon be serving their area. Ask them to voice their interest to Alex: [email protected] or 802-451-0555. We will discuss our route proposal in detail at our next Advisory Board Meeting on Thursday, April 28, from 12:30pm – 2:30pm in Keene. If you are a registered Monadnock Menus buyer or vendor and want to be a part of the Advisory Board discussion, please join us at the meeting! Keep your eyes out for more meeting details in a forthcoming email. Contact Alex with your questions: [email protected] or 802-451-0555. FEATURE INVENTORY Free-range, Organic soy-free grain fed. Want to spice up your sandwich without being overpowered? Use Ruth's Jalapeno Mustard on all meats and cheeses. A favorite on burgers and hot dogs-tangy with a jalapeno "glow" at the end that warms your mouth and tantalizes your taste buds! Great on all meats and cheeses. Tangy mustard with a horseradish bite! Add to deviled eggs or potato salad for a spicy treat. FEATURE INVENTORY Baby leaf mix of mild Asian greens, lettuce, spinach. Mix will vary with season. Description: Baby leaf mix of mild Asian greens, lettuce, spinach. Mix will vary with season.